Students take their lessons on a high quality acoustic pianos with teachers who are warm and patience and care deeply about helping guide each student to learn the music they desire to play. 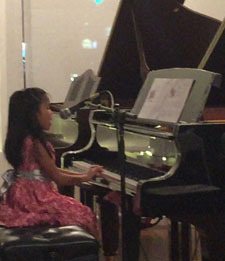 We offer instruction in Classical, Jazz, Pop, R&B, Cultural and more. We provide a broad foundation in sight reading, technique, music theory, improvisation, and composition to the extent that the student finds meaningful. We strive to have our students progress to be gratifying to their fullest potential. MTAC Certificate of Merit and Royal Conservatory curriculum is offered.